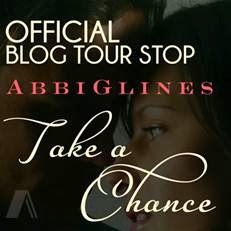 In Take a Chance Grant finally gets his story. From previous books we know he and Nan had some sort of relationship but upon meeting Harlow (Kiro's daughter and Nan's half-sister) its obvious there was this pull between the two and as a reader I couldn't wait to see what Abbi Gilnes had in store for them. The story begins in present day with Harlow being forced to spend time in Rosemary Beach, living with Nan while Kiro is on tour. It's an uncomfortable situation all around because Nan despises Harlow and is being forced by her father to share the house since ultimately he's the one who owns it. Harlow doesn't care for Nan either and her strategy the next 9 months is to avoid Nan at all costs. However, things get even more uncomfortable and complicated when on Harlow's first morning she is surprised to see Grant, the man she gave a piece of herself she can never get back to and who she hasn't had any contact with since he abruptly left LA, coming out of Nan's room! One of my most favorite parts of this book were the flashbacks. I really enjoyed watching Grant "woo" Harlow. In having the opportunity to see the early stages of their friendship and eventual relationship it also allowed Grant the opportunity to explain his initial draw to Nan, which is important to us readers because let's face it, finding out he and Nan were together was a shock and something many of us never really understood. The flashbacks also provide the chance to get to know Harlow better, and I have to say she is quickly becoming another one of my favorite female characters. Harlow may have initially come across as weak and quiet but we soon learn she is confident, strong, forgiving and can most certainly stand up for herself. We learn being a famous rock star's daughter isn't easy especially since most people seem to only get close to her because of who her father is. Grant turns out to be a unique circumstance because he's grown up around the fame and couldn't care less about it. After some time she believes he genuinely cares about her slowly starts opening up. Watching this unfold was beautiful. But then life happens, circumstances change and sometimes you realize the happiness you have with another person may not meant to be forever. Upon Grant's return to Rosemary he is forced to deal with some harsh realities and hard losses. Suddenly his fears come to the surface, they are out of control and unfortunately I felt as though they changed him. I have to say I wasn't a fan of the person he was becoming. He was weak, selfish, afraid to find joy, to be happy, afraid to open his heart and allow himself to fall completely in love. His reasons of course were understandable but I couldn't help but be disappointed in him. Fortunately he's got Rush as a "brother" whose able to help him find his senses and slowly the Grant we first fell in love starts to re-surface, but is he back for good? I'm just not sure, and that alone kills me! Nan...it's not possible to write a review without mentioning this force of recklessness, of fury, of drama. Nan is the same evil Nan she has always been and watching Grant with Harlow sends her spiraling even more out of control than ever before. I may be one of the few to say this but somehow, someway with this story Abbi Glines has convinced me to hate her a little less. She is a broken girl who hasn't ever had anyone really love her, she pushes people away and manipulates them I think as a defense mechanism. Don't get me wrong, her actions are still uncalled for, but I think it does help understand her better as a character. She still has a lot of redeeming to go, but circumstances in her life remind you she is still a person nevertheless. When the last page was turned I wasn't sure how I felt. Yes, questions are unanswered and things are left unsaid but that's why we're getting another Grant book. For me, my biggest concern was ending the book and being disappointed in Grant. I felt as though he had finally come so far that his behavior at the end while initially was understandable was still overall a let down. It's like he is right back at square one and it's going to take a lot in my opinion for him to be the man he needs to be, the man he can ultimately be. I hope in the end Grant will be the strong, fun character we first fell in love with!